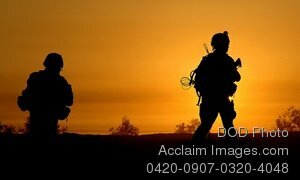 Description: Free, public domain image: U.S. Army Soldiers Crossing a Bridge at Sunset. U.S. Army Soldiers cross a bridge to Al Zunbria, Iraq, Dec. 29, 2007, during operations to secure the area south of their area of operation. The Soldiers are from Scout Platoon, Headquarters and Headquarters Company, 1st Battalion, 30th Infantry Regiment, 2nd Brigade Combat Team, 3rd Infantry Division. (U.S. Army photo by Spc. Angelica Golindano.